Green tea has fast become the miracle drink, with studies showing it can do everything from preventing cancer to reducing blood pressure. But what about the caffeine content? Is it bad for you? Is there even any caffeine in green tea? These are the questions we’re going to answer in our guide to caffeine in green tea. Is Green Tea Caffeine Free? How Much Caffeine Is in A Cup of Green Tea? Should You Worry About Caffeine? Green tea isn’t caffeine free. It’s made from the same leaves as black tea, white tea, oolong and all other tea types from the Camellia sinensis plant (the tea plant). These leaves naturally contain caffeine, so unless your green tea has been completely decaffeinated, it will always contain a low level of caffeine. Even though green tea isn’t caffeine free, you can still drink green tea at any time of day – which some people do as part of a diet or simply because they love tea. The caffeine in green tea is incredibly low and most people who are accustomed to drinking high-caffeine black tea and coffee won’t notice any caffeine effects when drinking green tea. While green tea has a lot less caffeine when you compare a cup of green tea to a cup of black tea (find our caffeine comparison chart below), it’s still enough to keep you up at night if you are extremely sensitive to caffeine. The exact amount depends on the green tea type. Gyokuro, a fine Japanese green tea, contains a higher level of caffeine compared to a Japanese Sencha or Chinese Dragonwell. 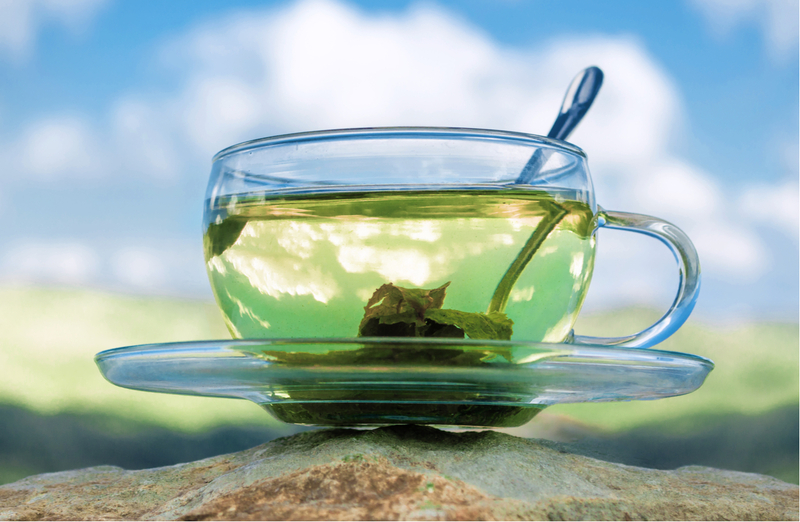 On average, 100ml of a standard green tea will contain 12mg of caffeine according to USDA. A standard mug size (8oz) of green tea will contain about 30mg of caffeine. 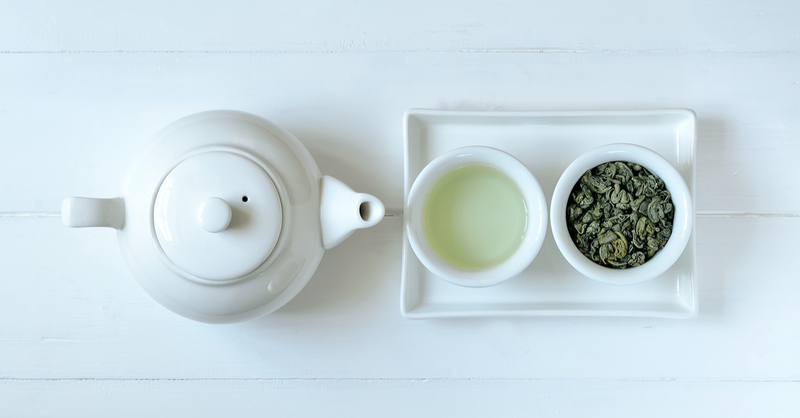 You might have heard that green tea contains more caffeine than coffee – that’s simply not true. We do know that tea leaves have more caffeine than coffee grounds before they’re infused with water, but when it comes to the actual green tea and coffee that we consume, the caffeine levels are far lower in a green tea than in a cup of coffee. Chinese green tea has typically less caffeine than Japanese green tea, simply because the pan-roasting and firing method of fixing green tea deactivates more caffeine than steaming them. There’s also more caffeine in the tips and buds of the tea plant, while the slightly larger leaves lower down on the tea plant contain less caffeine. Green teas like our Zhuyeqing are high-caffeine (for a green tea) as they consist of only the bud and top 2 adjacent leaves. The shape and glossy colour of the buds and leaves are why this tea is known as bamboo leaf tea. Other known high-caffeine green teas include Japanese Gyokuro and Matcha. Even these high-caffeine green teas won’t have as much caffeine as a black tea. Known low-caffeine green tea types include Japanese Houjicha and Genmaicha. Chinese gunpowder style tea can also be low-caffeine, as it’s made from slightly larger leaves with less caffeine that are rolled into pellet shapes. Did you know that you can reduce the caffeine in your green tea at home instead of buying decaf green tea? Rinsing the tea leaves will reduce the caffeine content by around 20%. To rinse your tea leaves, pour 80°C water over them, wait 10 seconds, then pour this water away. By discarding that first infusion, you’re extracting some of the caffeine and opening the tea leaves ready for the first drinkable infusion. You can also reduce the caffeine in your tea by changing your brewing method. Brew your tea leaves at a lower temperature for a shorter time – this will reduce the caffeine levels that infuse into your tea, but it will also reduce the flavour and antioxidants that infuse too. The amount of caffeine between different tea types and coffee types varies drastically. Use our table below to discover the average amount of caffeine in each of these tea and coffee drinks. A white tea or green tea is a great, low-caffeine drink to have in the evenings. It’s also quite interesting to see that on average, a Pu’er tea (a fermented type of tea that you can read more about in our Guide to Tea Types) contains as much caffeine as an instant coffee! For the tea drinkers who don’t know, an espresso is a small shot of highly concentrated coffee that forms the base of many coffee drinks, including a latte, Americano, and cappuccino. All these drinks have the same amount of espresso; thus they have the same amount of caffeine regardless of the milk/water ratios and how they’re prepared. We’ve missed Oolong teas out of our table because this tea type can be as light as a green tea or as heavy as a black tea. The caffeine level of an oolong tea depends on how oxidised the leaves are, so working out an average for all oolongs is very difficult. Oolong teas could fall anywhere between 12mg (like a green tea) and 20mg (like a black tea) per 100ml. What About Decaf Tea and Coffee? There’s a common misunderstanding when it comes to decaf drinks. They aren’t completely free from caffeine, they’ve simply got very low levels of caffeine. A decaf green tea usually contains about 2mg or 3mg of caffeine per 8oz, instead of the average 30mg. There are 2 main ways that green tea can be decaffeinated. The first, the organic method, involves using a solvent like ethyl acetate. This is a naturally occurring substance in fruits, so it’s generally considered a “natural” way to decaffeinate tea. The other method is the Swiss water method, which uses carbon dioxide and pure water to remove the caffeine via osmosis. This method of decaffeinating green tea is better for the flavour of the tea, but the process makes the tea more expensive to buy. 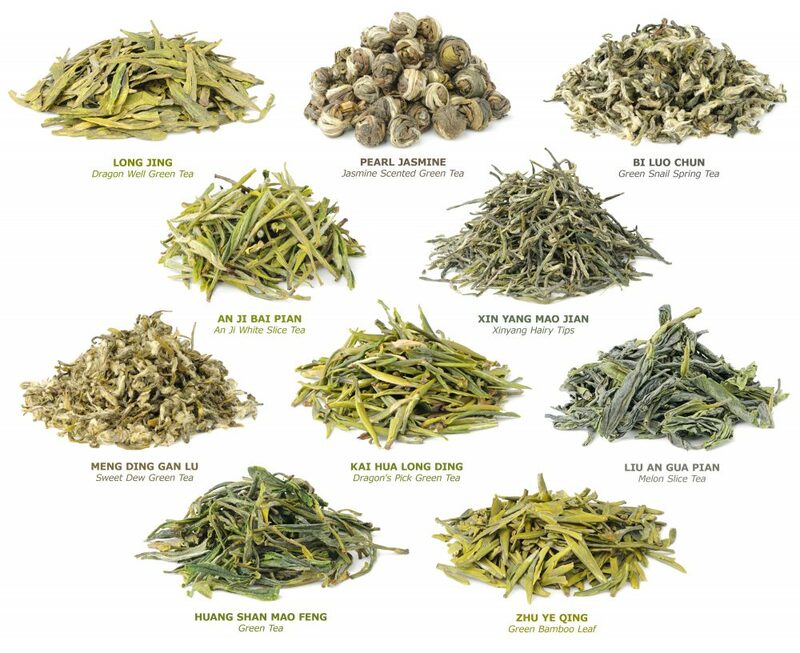 Just like how each of our loose leaf green teas will have a different flavour profile and caffeine level, green teas from different brands will also vary. Find your favourite green tea brand in the chart below to compare. Just bear in mind that these are estimated figures, the exact amount of caffeine in mg will depend on how you prepare it and how long you brew it! We’ve pulled these figures from the tea brands themselves, but a study in The Journal of Food Science found that the caffeine levels can vary widely and completely differ to what the brands estimate. Our advice? Don’t get too bogged down with the numbers. Even a high-caffeine green tea is still low-caffeine compared to black tea and coffee. Don’t let the caffeine get in the way of enjoying the flavour! Caffeine has both short term and long term effects on your body, some of which are good… others not so much. Generally, negative side effects are only prominent when you’re consuming a lot of coffee per day – over 200mg is considered to be too much by dieticians. You also don’t need to worry too much about caffeine in green tea because green tea also contains many healthy components, including polyphenols, antioxidants, and amino acids. These can cancel out the effects caffeine has: read more about the specific health benefits and issues green tea can cause you in our green tea health benefits and side effects article. More sugar in your bloodstream, released by your liver. Caffeine works by binding to your adenosine receptors. By binding and blocking these receptors, your brain receives less adenosine which is a chemical that makes you feel drowsy. This gives you that alert feeling as the less adenosine your brain gets, the more awake you’ll feel and the more your nerve cells are stimulated. This gives you that restless, motivated feeling. What makes green tea so special is the addition of amino acid L-theanine. This naturally occurring chemical also affects your brain; it blocks some stimuli receptors in the brain and instead stimulates the GABA neurotransmitter. This will make you feel calm, relaxed and non-stressed. Put simply, caffeine and L-theanine work together in green tea to help you feel wide awake yet focused and calm. You won’t feel as jittery as you’d usually get from caffeine drinks like coffee. Tremors and an increased heart rate, putting a strain on your heart and blood vessels. You’ll also get caffeine withdrawal if you consume a large amount of tea and then go “cold turkey”. Once caffeine is no longer blocking adenosine from reaching the receptors in your brain, you’ll get a flood of adenosine that your brain will feel very sensitive to. Symptoms of withdrawal include; drowsiness, depression, lethargy, headaches, and even nausea. It’s generally considered safe for most people to consume caffeine in small amounts – one cup of green tea contains a very low amount of caffeine and so is a perfect choice to get accustomed to the effects of caffeine! 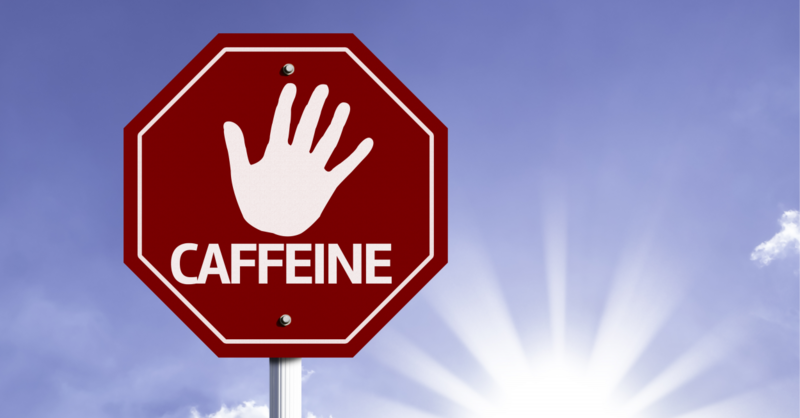 The limit of a healthy daily amount of caffeine is generally around 200mg. You’d need to drink 8x 8oz mugs of green tea in one day to surpass that limit. Those that should avoid caffeine are those that are extremely sensitive to it and children, as it has a more notable effect on children and can cause anxiety. If you’ve been advised by your doctor to avoid caffeine because of a heart condition, it would be wise to avoid it as much as possible even though it’s highly unlikely that the small amount of caffeine in a green tea will cause a heart attack. At this time, there’s no hard evidence that consuming caffeine will affect your baby when you consume it during pregnancy. Again, the advice both in the UK and the USA is to consume under 200mg of caffeine per day if you are pregnant or breastfeeding. Caffeine in green tea isn’t something you need to worry about. With the calming effects of L-theanine and the naturally low level of caffeine in most green teas, you won’t feel any adverse effects unless you drink it litre after litre! 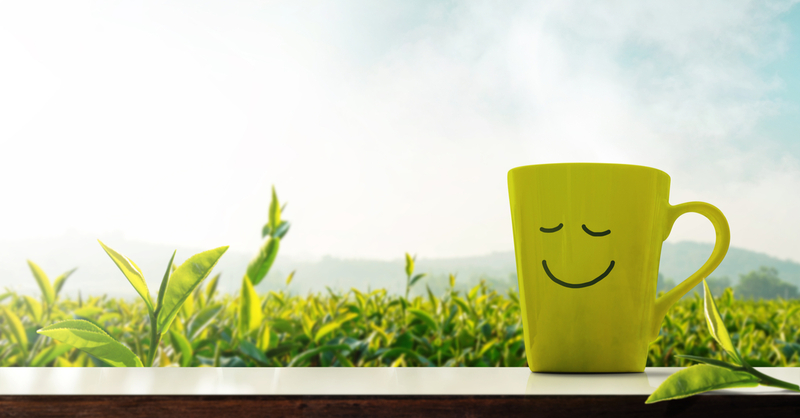 Enjoy your green tea with calming peace of mind, knowing that the caffeine in your cup isn’t going to do you any harm.